French video game designer Patrice Désilets is certainly a man who understands video games. After all, he played a key role in turning an early concept for a Prince of Persia game into the first Assassin’s Creed game. Assassin’s Creed, as most people who are into video gaming know, is Ubisoft’s best-selling video game franchise, the latest entry of which (Assassin’s Creed Odyssey) definitely hit all the right notes as we pointed out in our review. However, Patrice Désilets is no longer at Ubisoft – sadly, the man had to leave the company by the back door after THQ Montreal was bought by the French giant back in 2013, leaving the game he was working on at the time unfinished. But Désilets recently said in an interview with VG247 that he intends to finish 1666: Amsterdam (or Amsterdam 1666 as it’s also known), although the game might be very different from what he was working on during his THQ days. This is because not only has technology moved forward since those days, but with Désilets now running indie developer Panache Digital Games, he obviously no longer has access to the massive budgets and AAA teams he could harness at Ubisoft, with the veteran French designer admitting he’ll likely “restart from scratch” regarding the game. Of course, Désilets also had words to say about Assassin’s Creed, the series he was instrumental in creating back in 2007, and how it’s similar to Ancestors: The Humankind Odyssey, his eagerly anticipated upcoming game. Ancestors is a third-person game with survival elements, featuring proto-humans struggling to survive in a hostile world. One similarity between this game and the Creed series has to do with the way hiding spots feature in both games, as Désilets himself admits in the interview. “Aha, yes. I guess that really fascinates me. I didn’t even realize, the first thing I ask the player to do is find a hiding spot. Just like in Assassin’s Creed, that you find hiding spots. It’s like ‘holy sh*t’ I didn’t know. Because it made sense. You play as a baby, so you’re afraid. You must hide the baby, so I say go find a hiding spot”, said Désilets. Another similar concept to those in Assassin’s Creed are the game’s lineages. Playing as a clan, you can switch between different clan members, but if they all die, then it’s game over – with dozens of hours of gameplay potentially going to waste. “Your lineage would go extinct”, said the French designer. Aside from discussing Ancestors, Désilets had more to say about Assassin’s Creed too. Regarding Ubisoft’s games, he said Assassin’s Creed III is the last one he’s played, and wasn’t happy about it – “I played for two hours and I was working and was not having fun” admitted Désilets. Regarding more recent entries, like Assassin’s Creed Odyssey, the ex-Ubisoft man admits he hasn’t played them, and is just focused on his upcoming game Ancestors for the time being. 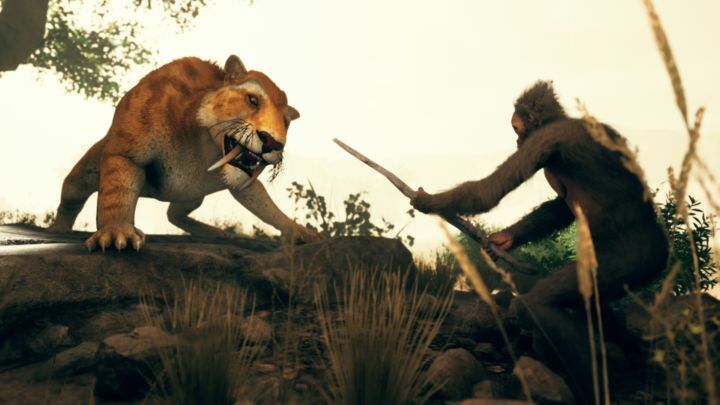 And it would be a great thing if Ancestors: Humankind Odyssey surprises everyone when it comes out, possibly later this year on consoles and PC. Désilets also talked about creativity in the games industry, and how some ideas (such as the concept of hiding spots) have made their way into countless games, even joking about the games he’s made thus far. “I’ve done the same f*ck*ng thing. If you look at it, all my games are about a guy running around with a sword”, said the video game designer.